The Mind Body Soul Experience organisers are kindly offering readers of A Bad Witch's Blog two pairs of free three-day passes for the next month's Mind Body Soul Experience in London - normally priced at £54 . All you have to do for a chance to win a free pair of tickets is enter a simple competition - the details of which are further down in this post. This great prize gives you the chance to attend the Mind Body Soul Experience at London's Olympia Central absolutely free of charge - and have a great time while you are there. You can engage your mind, indulge your body and nurture your soul at the three-day event from 24-26 October. With meditation, Bollywood dance and palm reading among many other activities, you’ll have a weekend to remember. Musical performances and crystal singing bowls will delight you as you soak up the multi-cultural atmosphere. Visitors come to the Mind Body Soul Experience to relax and unwind, and experience new ideas from ancient wisdoms. This event aims to offer an experience like no other, and what’s more, this year there’s a big added benefit for all visitors – entry to the Mind Body Soul Experience allows you entrance into the OM Yoga show at no extra charge. Two shows for the price of one. To be in with a chance to win two pairs of tickets just answer the following question. Which of the following will you be able to find at the Mind Body Soul Experience? Email your answer to me, the Bad Witch, at badwitch1234@gmail.com by the closing time of midnight, Sunday 12th October 2014, to be in with a chance of winning. The two winners will be picked at random from the correct entries. 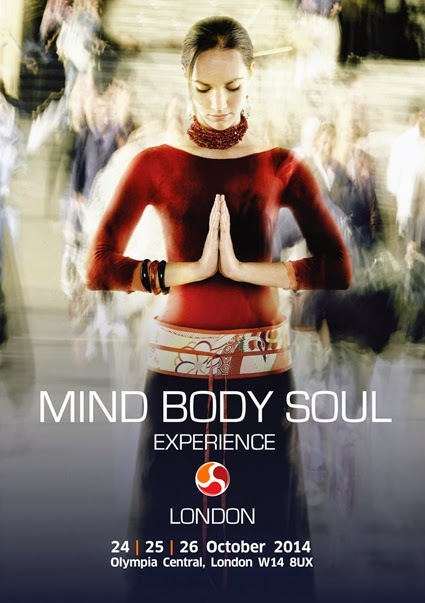 The Mind Body Soul Experience is at Olympia Central, London, on 24, 25 and 26 October, 2014. Two and three-day tickets also available online.